At a retirement home and/or classroom, I talk about behavior, habitat, food, health, the green spaces and much more. Each performance is geared to the specific audience. From 2 years to 92 years, I have found that parrots fascinate. I hold the parrots for the audience to touch, allowing some of them to hold a bird on their hand. Each child wipes their hands before and after touching the birds. At a birthday party, my birds will stand on the hands and arms of the children. Sometimes they talk. They put the marble in the cup, ride the remote control car, hang upside down, allow children to pet them and display the unbelievable colors of the rainbow. I talk briefly about the forests, food and care of a parrot. The birthday child gets a long feather and all the other children get smaller feathers. At a training session, I clip wings, trim beaks and toe nails. 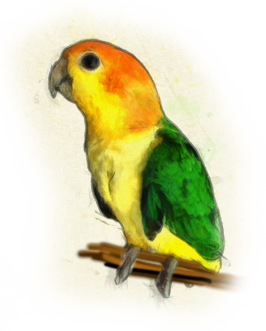 I teach you how manage the parrot, get it out of the cage, hold it in case emergency aid is needed, what disciplines are effective, behavior warnings, and how to start teaching tricks through play. Most importantly, I teach you to expect more than a bird in a cage. At a business promotion, such as a car wash, I stand in a safe place outside for the traffic to see. I hold a BIG parrot doing fanfare tricks… spreading wings, hanging upside down, etc. I post a sign with a time to see the parrot show (while you wait for the car to get washed), or I can just hang out with a couple of birds to draw in the customers. I am open to suggestions and will implement ideas of how better to promote your specific business. If you use environmentally safe products, I specifically promote those. I participate in parades, pet shows, and warmer outdoor functions.